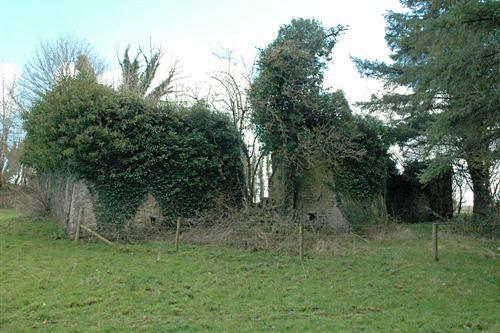 On part of what was called Bawnboy Demense the large 33 acre field in front of Bawnboy House was called `The Lawn'. Tradition tells us that this land was once Magauran strongholds. It was confiscated under the terms of the Ulster Plantation, 1609. Two brothers, Sir Richard and Sir George Greames, sons of George senior from the Scottish border were each given 1000 acres in Bawnboy and the surrounding area. In a report dated August 1622, it is stated that Sir Richard Greames holds 1000 acres on which is built a bawne of stone and Iyme, 60 foot square and 9 foot high, with a little stone house within, where in Lieut. William Ruttledge dwelleth and hath a lease thereof and of 200 acres of land for 21 years. The rest of Sir Richard's 1000 acres are set to the Irish from yeare to yeare, who plough after ye Irish fashion. Part of the bawn and castle may still be seen to the left hand side of the avenue, which leads to the old GAA grounds. The bawn wears a heavy coat of ivy.